An ocean beyond your balcony. Order food and drinks and shoot some pool. Relax on the massive pool deck and admire views of the ocean. Grab an inner tube and cruise down outdoor and indoor lazy rivers. Escape the cold weather with a swim in the indoor pool. There's a convenient poolside bar and grill. 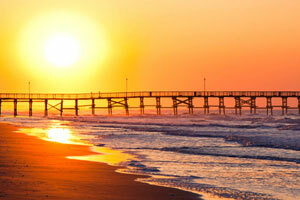 Avista Resort is located in the North Myrtle Beach near the area’s best attractions. Stop by your condo to drop off your luggage – don’t bother unpacking, there will be plenty of time for that later! Change into swimsuits, grab goggles, pool toys and water wings. Spray everyone head to toe in sunscreen and get ready to hit the pool deck. Outdoor options include two pools, a children’s pool, lazy river and two hot tubs. Lounge with a cocktail from the poolside bar and get comfortable, you’re going to be here for a while. Indoor options are a pool, lazy river and a hot tub. All indoor options are climate-controlled. There’s a fitness center on-site if you want to get your cardio on. Individually furnished and decorated one- to three-bedroom condos sleep four to ten guests. Stop by Kroger for groceries – your full kitchen won’t stock itself. The kids will be begging to help make your famous chocolate-chip cookies (and be the official taste testers). And freezers are perfect for storing dessert – popsicles for the kids (and a stash of Klondike Bars for the grown-ups). Take a night off from cooking and eat at the on-site lounge and restaurant. You don’t even have to leave your condo – they deliver! Watch a Friends rerun on your flat screen tv with cable. DVD players are perfect for a low-key night in. Bring favorites from home, pop some popcorn and get ready for family movie night. Take advantage of the laundry facility on-site and throw in a load of laundry, now you’ll have one less thing to do when you get home. Avista Resort is located along miles of sandy beach, perfect for working on your sun kissed look while the kids build the sandcastle of all sandcastles. Gather all of the golfers in your crew and get ready for a little friendly competition. Surf Golf & Beach Club is just a short walk from Avista Resort. Designed by George Cobb in 1960 and renovated by John LaFoy, the course welcomes all experience levels. The SkyWheel is just a thirty-minute drive from the resort. Hop aboard a climate-controlled gondola for a peaceful ride almost two-hundred feet above Myrtle Beach. The interactive exhibits at Children’s Museum of South Carolina are sure to be a hit with the little ones. They will have so much fun pretending that they won’t even realize they are learning. Check out all of the shopping and dining options at Broadway at the Beach.